The players pack is available and contains details of the missions and payment details. The Mynock Templates are available (these will be provided). 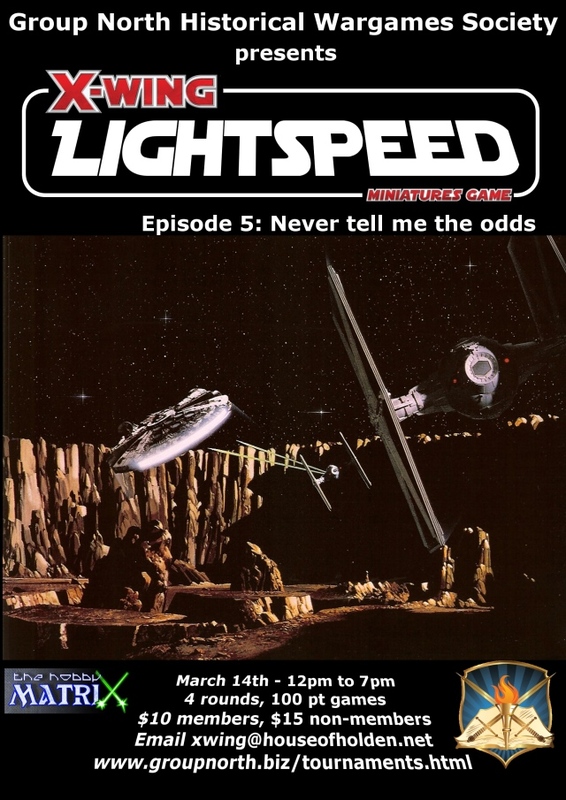 Lightspeed will continue as a Rebel versus Imperial only competition. Upgrade cards from any set can be used. As always registration and payment by March 7th will go in the draw for the early payment voucher from our sponsors The Hobby Matrix. Registration and payment can be made up to the start of the event. When registering nominate your preferred side; the early registrations will be assigned that side while later registrations may have to change sides to balance the fleet. The early bird entry prize has been donated by Darryl from Nerdvana games. One VT-49 Decimator will be raffled off between everyone who has paid by the week before the competition. Payment details coming in the players pack soon. The players pack is now available. Any changes that occur due to further testing will be notified to all players. Im planning to come, will be running Imperial. Paid up - for the Empire! Hmm, we'll soon need a rush of Rebel fans. Some may have noticed the large number of X-Wing competitions in March. Don't forget that Lightspeed runs in a different format to the other competitions so you aren't just grinding through dog-fight after dog-fight. We also have a great group of players in a relaxed competition in a venue with plenty of space, all worth coming along to. There is going to be an update to the Ion Storm mission. The counter will start from 7 instead of 8. Play testing found starting from 8 meant the storm had a minimal impact on the game. I'm making up some record keeping tracks to help in game. I'm also going to make some templates to represent the mynocks and space slug. These will mean the attack range is a little less than range 1 from the edge of the asteroid but it will make it much easier to remember that your ship is being attacked. The players pack will be updated when I have some sample templates to show. Don't forget there is a couple of weeks to get in for the Decimator early bird prize draw. Add 2 more to your list. Trying to get one more too. Can I borrow a Y-Wing? I can hook you up if you need. Add one more - Jason Glumart - probably Imperial. There is an imbalance in the force... We'll need some more Rebels joining in soon to help even out the sides. No-one needs to swap yet, there are still a couple of weeks till the competition runs. Also, just one question, now that scum has dropped, even if we can't play scum as a faction, are upgrade cards found in the new scum boxes legal? i.e: Auto Thursters or Mangler Cannon? Upgrade cards, provided they are the originals from the box, are permitted. They'll be excluded if they are S&V faction specific but only because no player will have a fleet of that type to be a valid target. A reminder that entires paid for by March 7th will go in the door prize draw for a VT-49. See the players pack for payment details. Entries can be received up to the start of the event. Anyone who pays tomorrow please let me know at xwing at houseofholden.net so that I can put you down as prepaid (if the money takes a little longer to clear). Those who don't pay tomorrow; you can still enter right up to the day but you're more than likely to have to play a Rebels list at the moment.